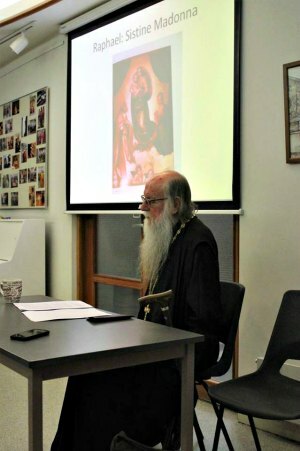 On Sunday 7 May, Father Andrew Louth gave a lecture entitled ‘The Rediscovery of the Icon’, in the Russian Orthodox Church in Amsterdam. The V. Revd. Dr. Andrew Louth, is an ACOT staff member. During his lecture Fr. Andrew told the story of how the icon was rediscovered in the Greek and Russian traditions. He also discussed iconographers such as Photios Kontoglou, Saint Mary of Paris and sister Johanna Reitlinger. You can find photographs of this event on our Facebook page and a fragment of the lecture on our Youtube channel. The text of the lecture will be published in Sobornost.